A quiet Sunday again: we’ve been off grocery shopping with a neighbour, and are now recovering next to the fan, drinking cold water. After a big thunderstorm last night, Accra is back to 32C and it is a sticky day. The harmattan is due soon, the dry northeasterly trade wind which blows from the Sahara Desert, bringing dust and hazy days. It’s already noticeable in the north, we hear, not so much here yet though humidity is dropping. I am soaking klippfisk for dinner, dried and salted cod from Norway, to try making bacalao later. And our banana glut continues, so this time it was sesame banana pancakes. Add dry ingredients to a bowl: flour, baking powder, salt, cinnamon and oatmeal. Add the eggs and milk, and whisk it all together. Add the mashed bananas. Leave it to rest 15 minutes or so, then dollop a generous spoonful onto a hot oiled frying pan and fry until golden each side. Makes 10-12 depending on size. 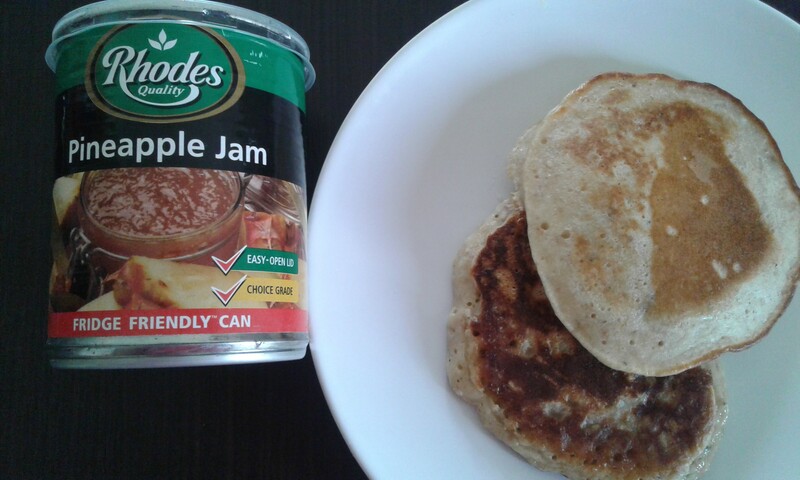 We had these for breakfast with tinned pineapple jam from South Africa, listening to a reggae version of Celine Dion’s “That’s the way it is” on the radio. Reggae is popular here, so is Celine Dion. The French cultural centre Alliance Française in Accra hosted a Celine Dion evening here in October, Ghana celebrates Celine Dion, with Dutch and local singers performing. Quite an experience, and it was nice to hear live music – we do enjoy that here. We were at Alliance Française for pizza last week, and it was hip hop night – hmmmm, we enjoyed the pizza and then escaped. I must be getting old. With two weeks to go until Christmas departure, a neighbour and I did the rounds yesterday: over to Osu for coffee, and gift shopping at Global Mamas. Fair trade (also online), and lovely jewellery, batik clothes and bags. They also have some items from Trashy Bags, a social enterprise based in Accra that makes recycled eco-friendly bags and gifts from plastic trash. Like here, a toiletries bag from recycled drinking water sachets. They also have an online store. Then we popped by the Chinese supermarket for fresh tofu, before we finished up at the French Christmas market. Now I just need to sort out who gets what, and supplement this with a book order. Not very commercial or holiday-ish here, which is fine. For some seasonal ambience I’ve tried to watch the start of this year’s Norwegian TV advent calendar Snøfall (yes, for kids) online, which actually works from Ghana! But our Internet is too slow to watch it, despite our buying more bandwidth on Airtel scratch cards today. Our other Internet provider is down. Oh well. I really cannot complain, we are comfortable enough here and I’ll be able to Skype with friends during the holidays. It is soon time to pull out shoes, socks and the few winter clothes we have here, as we’ll be celebrating Christmas in Norway this year. Brrrr! Reading the news, I have learned a new term this week: voting skirt and blouse. “Skirt and Blouse is a term in Ghanaian politics where party supporters vote for the flagbearer of the party but not the parliamentary candidate of the same party or vice versa.” The elections here are on Wednesday, when Ghana goes to the polls for presidential and parliamentary elections on 7 December for its seventh multi-party ballot since the end of military rule in 1992. Best wishes for that. This entry was posted in food, fruit, Ghana and tagged banana, living in Accra, pancakes on December 4, 2016 by krumkaker.